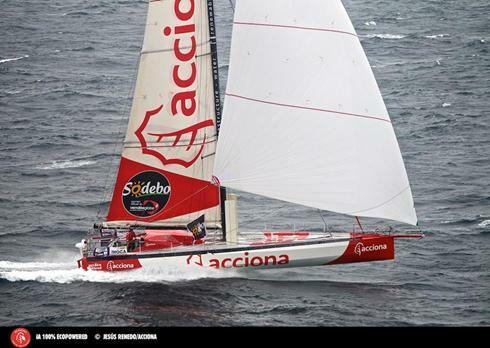 Owen Clarke Design's eighth and latest Open 60, Acciona 100% Eco-Powered is the first IMOCA 60 zero emissions ocean racing yacht, which is to say she will be racing the Vendee Globe without fossil fuels (diesel typically) of any kind aboard. Where an IMOCA 60 would normally have a diesel engine for auxiliary drive and power generation this has been designed out and replaced by an electric motor and batteries charged by a system of solar, wind and hydro-generators. Kingfisher: first Open 60 with central ballast and the now familiar three forestay set up. Acciona 100% Eco-Powered is the result of collaboration and enormous effort of the Acciona project team, builders/suppliers and was again co-designed with American designer Clay Oliver along with the now familiar OCD team of associates; including UK based structural engineers SP Gurit. Michel Kermarec and Giorgio Provinciali (both BMW Oracle) provided the CFD muscle that saw a computer simulated analysis of the design run in parallel with the testing of six 1/7th scale and a 1/3rd scale tank test model overseen by Ian Campbell of the Wolfson Unit. For the previous edition of the Vendee Globe, two of Britain’s most famous solo skippers, Mike Golding and Dee Caffari, chose the Design Team of Owen Clarke Design and Clay Oliver (Team New Zealand lead designer for the last three Americas Cups ) to design their entries. Our sixth and seventh 60's Ecover 3 and Aviva were launched in 2007. 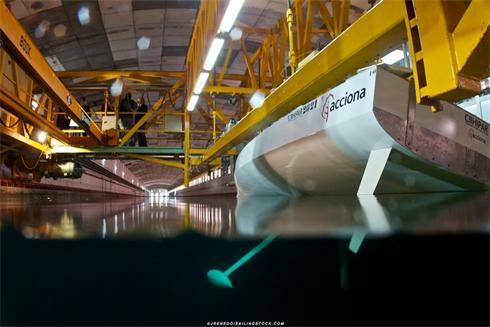 As well as a 1/7th and 1/3rd scale tank testing, rig development and cfd program, the two projects worked together in a ‘technical alliance’ and with OCD and North Sails on a two boat testing program prior to the Vendee Globe. Both boats were built as sister-ships and when first measured the two designs were within 30kg of the same displacement. Owen Clarke Design have been involved in sailing and developing this hugely successful Class for sixteen years. Our introduction to the open 60 class began in 1993/94 when Merfyn Owen took a sabbatical from the design business and sailed the world’s first open 60, Thursday’s Child from Australia to the USA, via Cape Horn. He was then lucky enough to be asked to project manage two BOC/Around Alone campaigns, in 94/95 (Thursday’s Child) and 98/99 (Team Group 4).
. Kingfisher (Owen Clarke/Rob Humphreys), with the closed cockpit typical of the 90’s generation boats. Experience gained by the close involvement in the development of Mike Golding’s, Finot designed Team Group 4 led Merfyn to approach Rob Humphreys, Andy Claughton and Giovanni Belgrano, asking if they would be interested in joining a design team to develop a new open 60 for a then non-existent customer. All agreed and shortly afterwards Ellen MacArthur’s Offshore Challenges company sent us a design tender package to which we were able to respond. In April 1999 Kingfisher were announced as Ellen’s sponsor, and the Kingfisher Design Team was officially created. Owen Clarke Design were the lead designers and overall managers of the design and construction of the yacht. The success of the Kingfisher campaign led to a marked growth in activity and an investment in people and research into open class yachts by Owen Clarke Design. In 2000 we were commissioned to design the HSBC sponsored Open 60, Hexagon, for Graham Dalton for his entry in the 2002/2003 Around Alone, continuing Owen Clarke’s link with this race. Hexagon was renamed Pindar in 2003 and was raced by Emma Richards and used by Mike Sanderson for crew training and design development for his ABN Amro Volvo campaign. 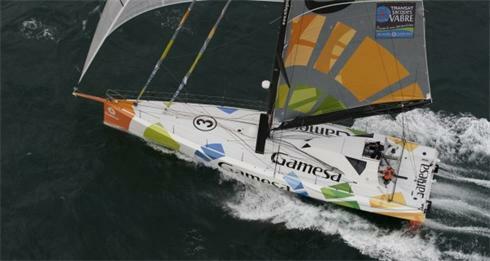 Out of Hexagon grew our design for the 2004/2005 Vendee Globe. 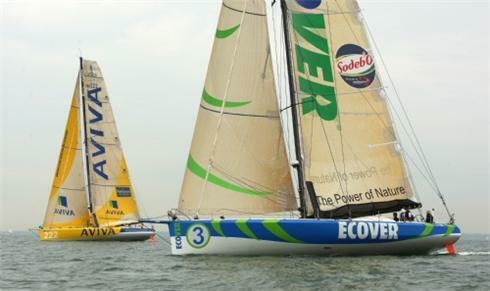 The new Ecover was the second boat of that name for Mike Golding Yacht Racing, and completes a circle that Mike and Merfyn began in 1997 when they were both skippers on the BT Global Challenge planning the design, construction and campaign of the open 60, Team Group 4 (later the first Ecover). In parallel with the Ecover tank test program, progress on the rig options was also being made. Ahead of this project we had entered into a development program earlier in the year with Southern Spars. This paid huge dividends because by November we had three fully worked through and mass audited rigs, all of which had been integrated into the final hull design. Any one of these would have suited our purposes, optimising all the usual (box) rule parameters for the open 60 class, such as the ten degree rule, angle of vanishing stability etc. For the Vendee Globe some of the normal decisions regarding outright pace were tempered with the need for comfort and reliability. The decision making process usually involved programmed meetings between Merfyn, Mike, the relevant members of the extended design team and Martin Carter. Martin was Owen Clarke’s full time project manager and he reported directly to Mike, working closelywith the design team when choices were made. Merfyn’s brief as well as watching over the construction of the yacht also included providing project support on critical areas of campaign planning for the Vendee. Ecover 2 was launched in mid June 2003 and completed builders’ trials in New Zealand before being shipped to Europe. 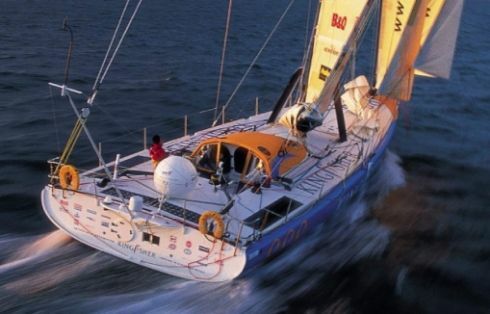 In the summer of 2005 Ecover won The Transat Race from Plymouth to Boston, a victory that in many sailors and pundits eyes made him the favourite to win the Vendee Globe. In the spring of 2005 construction started in Canada on the fourth Owen Clarke Open 60, the first pre-preg carbon Nomex yacht of its type to be built in North America. Spirit of Canada, aeffectively a sistership of Ecover 2 was built by an in-house team of builders in Toronto for Canadian yachtsman, Derek Hatflield. 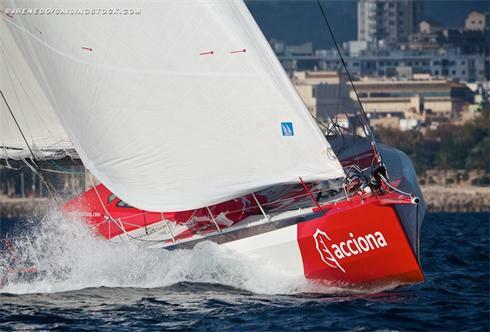 Temenos, our fith Open 60 was launched in 2006 and finished third in the 2007 Barcelona Round the World Race. For Temenos we assembled a team of ten top designers and engineers from all over the world. 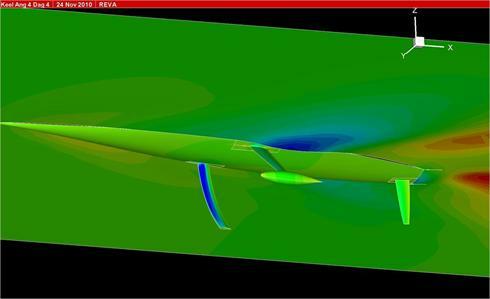 All are involved at the cutting edge of design in disciplines such as computational fluid dynamics, finite element analysis, tank testing and composite engineering. No fewer than five of our associates currently work for some of the leading Americas Cup teams. So, although Owen Clarke Design is a UK company and the designers of the boat, we are the leaders of a much wider international team. When we have the time and the funding this is how we prefer to work. Normally our research and development programs are exclusive to one particular client and we are not able to use that information for other projects until a certain date. For Open 60 ‘s this has normally been the start of the next edition of the Vendee Globe. However, for Dominique’s project Temenos and Owen Clarke Design shared the cost of the research and development program. This means that OCD could use the research data for other clients for the same edition of the Vendee Globe. The advantage to Dominique was that by combining resources we were able to carry out significantly more development work on Temenos than would have been possible otherwise. In addition to our usual investigations the additional funding was channelled into a multiple model hull tank test program, CFD work on keels, bulbs, and rudders. The entire boat was re-engineered again and in order to input more accurate values into the calculations a parallel program of materials testing was undertaken in the laboratory. Of course a research and development program is not obligatory to obtain a fast boat. We're sailors as well as designers. We understand that performance is also won by putting the yacht in the water as soon as possible so the skipper can become acquainted with their machine and the preparateurs make her reliable. Always for the builder the hull is the first item on the critical path and so sometimes there is no time or perhaps no money available for tank testing. This was the case for Hexagon and Spirit of Canada. In cases like this we use our modified Open 60 vpp to develop designs as far as we think is prudent. Owen Clarke Design are continually evolving their boats however and some research is always possible since the builder does not require all the plans at the start of the project. Owen Clarke Design will sit down and listen to each project regarding the schedule and requirements for the individual client in order to formulate with their input a design package to suit the campaign. Mike Golding's modified and updated Gamesa (ex Ecover 3). Click the image above to see a compilation sailing video of the boat since her re-launch and the end of the 2011 B to B. For the process behind and details of the modifications made see the February edition of Seahorse.